Hi there! Here’s a new post, finally, with two screenshots to make up for the lack of updates over the summer. The game is starting to resemble the real thing more and more, so there is a lot to talk about, even if everything is not 100% done yet. The first thing that jumps out of the screenshots should be the readability update. I picked a busy situation from the Normandy Breakout scenario (after the jump) to showcase this: note how it now reads better even though we’ve actually increased the clutter by adding city names to the map. HQs are a new mechanic, first mentioned here, but now you can see them in-game. Check out the repair bridge, motor pool, pin down, etc. actions available to Patton’s 3rd Army. 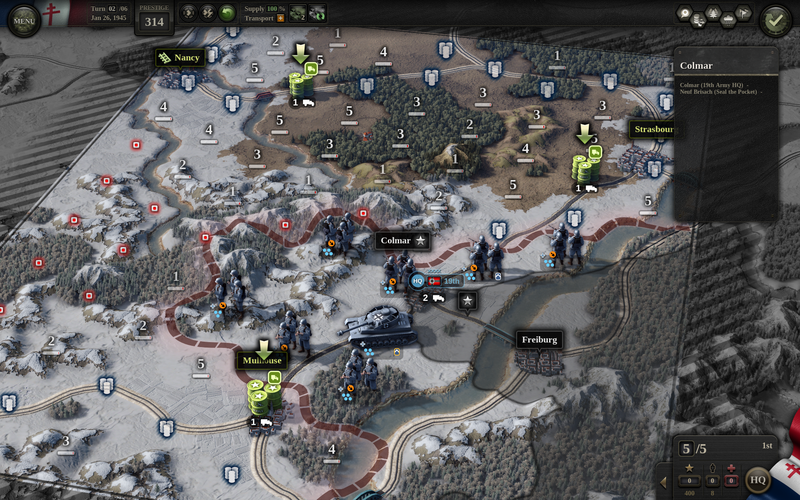 Each HQ is organized into five branches which can be upgraded in the campaign or suppressed during play. The intel branch is interesting in that it provides visibility into Fog of War. At the level shown it provides 2-hex visibility, plus another hex of intel markers. This ability runs once at the start of turn though (similar to how supply works) – units that move into FoW later in the turn only uncover a single hex. Supply is our core business, so we spent a lot of time working on it over the summer. We’ve added supply hubs and disruption, as first described in dev diary 5. In brief: supply still travels by rail, but from there it does not spread automatically any more: you need to place supply hubs in suitable locations. The screenshot below actually shows the view that you see when placing a new supply hub – this is similar to, but not the supply view. You can place hubs at will along rail-connected locations, and the only penalty for moving them is a 1- or 2-turn delay involved. We’ve added enemy supply view, which was much requested in UoC1. I was hesitating on this previously because it wasn’t clear what the FoW-visibility should to be for supply. As it turns out, the player has full knowledge of enemy supply sources and hubs, so it’s possible to create this view. Disruption is still hidden though, so the horizontal disruption bars you see in the screenshot are not there when you’re viewing the enemy. We’ve added multi-level undo, where UoC1 could only undo a single action. This turns out to be useful precisely because of the supply hubs: it takes a few actions to deploy them and see what kind of supply network results, and so requires a deeper undo. In other news, there are now play/pause buttons during AI turn, similar to History Mode in UoC1. The camera rotation works with angle instead of angular velocity (hah!) which helps if you’re running with a low framerate. We’ve enabled using the system mouse for this purpose as well – the game remains totally playable even very on low framerates, except the mouse gets laggy, and system mouse pointer helps. We’ve added SSAO which looks pretty, however it’s a subtle effect so you may or may not see a difference. Yersh another update! Can’t wait for this one you guys. Before end of year release? Oh and wondering about scaling, it’s getting more of an issue on higher res displays, especially war-games get this wrong a lot. I run at 1440p and many run at 4k (2160p). Will the game scale the UI and units to not be too small at such resolutions? Looks unreal, So excited for this game! Re: scaling. The 3D, “world” part of the game scales seamlessly and that includes the units, terrain and all the in-world information (steps, city names, icons, lines, everything). All assets have been created specifically with 4k in mind. The 2D, “UI” part of the game (menus, etc) also scales *in principle*, but I haven’t shaken this code out yet. It’s one of the things to do before the release. I expect everything will scale, basically. One detail question: where are all the German 88s? I can’t see any in Normandy or Colmar! You guys are awesome. I haven’t bought on day one for a long time, this will break the streak. Very interesting and quite pretty. Makes me hope even the more that you will release a Macintosh version. Looks amazing. My only wish is that you make the operation (scenarios) a bit smaller force scale as looking now at the Normandy screenshot I am missing Carentan and special US airborne units. 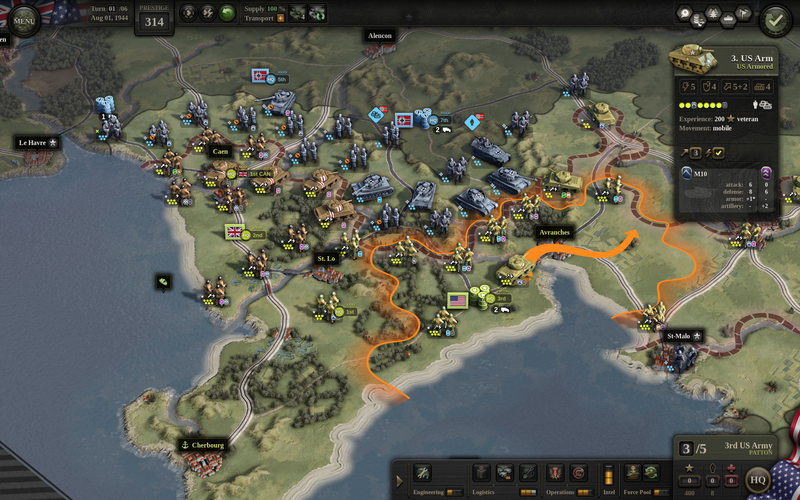 @Tschemo: the screenshot is from the Normandy Breakout scenario (i.e. Operation Cobra) which is played in regular map scale. Normandy landings (i.e. Operation Overlord) will be played on a special zoomed-in map, with perhaps 50% more hexes. This is still not done, but we’ve verified that it works in principle. 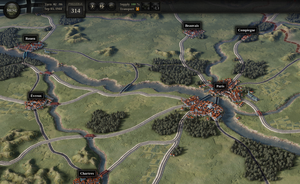 So the map may well show Carentan, however the units will still be divisional scale. There are several interesting Allied specialists though (Rangers etc). Hello tom and thanks for the update. I’m a huge fan of the first game and I was wondering one thing: will there be a 2D rendering mode (to have a render like the first game)? Beautiful ! Can not wait to play it. Wait, special zoomed-in map?? This changes everything … it means scenario designers won’t be glued to a single spatial scale. It means infinite possibilities for scenario design! Also, can we see the campaign tree? Pretty please? @Sourdust: yes we will be shipping the map editor this time around (as opposed to just the scenario editor like we did for UoC1). Before you get *too* excited, please note that map making takes an *incredible* amount of time if you want to get it right. We will only be shipping zoomed-in versions of Normandy and similar areas where we have extreme unit densities (Berlin etc.) Everything else is up to the community, but the editor totally allows it, yeah. Much better. I am really looking forward to this game. Bear in mind that when the units have idle animations, i.e. some sort of minor movement while standing still, the readability will be there. Photoshop stills sometimes give a wrong impression. I looked recently into Warhammer 40,000 Gladius Relics of War. Their lighting is horrible, but it is interesting to learn from their mistakes. The game is interesting, but the overall colors are badly lit with too much darkness. When I tweaked their shaders I finally got better results, which was interesting for comparison reasons. Just curious–who will be the first person to play the new edition night and day to the very end? The British Soldiers will eventually look British (uniforms and helmets-they still look like GIs now), right? thanks. @ken: yes! In fact I’ve received the UK infantry 42 model in the meantime, so they should be showing in the next post already. Could you tell at this point if the game will be DRM free?